These days we are told of the many things we can do to postpone or avoid the dreaded Big A – Alzheimer’s disease. Crosswords, sudoku, gardening, exercise, learning a language – and others – have all been touted as the answer. I have heard that it really comes down to having a passion. So when someone asked me recently “what are you passionate about?” I had to stop and think. I retired early – frustrated by spending more time on paperwork than on helping “clients” in the health care system. For much of the last fifteen years I have been caring for my husband or my daughter – sometimes both – as they moved through various phases of different illnesses. But this year they have both been well, and I have had more time to explore how I want to spend the next 20 years or so. Providing I keep the Big A away. I took up Bridge. I loved it at first, but playing in a crowded room of chattering older-borns is not as enticing as playing in the quieter surrounds of lessons. And my competitive instinct can take the fun away when I don’t play as well as I’d like. At school, I would infuriate my Latin teacher by making silly mistakes while getting the harder things right. Sadly, the pattern has carried though to Bridge. I will persevere, but Bridge is not my passion. I volunteer at one of Sydney’s museums. It’s a great opportunity to meet people and tell them about our fabulous city and its Indigenous and Colonial histories. But the days can be very long when visitor numbers are down. And despite wonderful volunteer events, it’s not my passion. I tried volunteer dog walking. But the dog didn’t like me, and remembered the first time I caught his skin in his harness. He refused let me put his lead on, causing difficulty for his frail, vision-impaired owner. So when she had a fall and the dog was cared for by relatives, I gave it away. Volunteer gardening was the next attempt. This one I really love. The gardeners are a great group of people, many of whom have been helping for years, and it’s good to have my hands in the soil. It’s wonderful to see bedraggled, overgrown gardens come to life after we weed, prune and mulch. But somehow, other things get in the way, and my attendance has become erratic. So, it’s not a passion. I really enjoy yoga, and walking – especially in the bush, and I do both regularly, but although they keep me fit, they aren’t passions. Many years ago, when I was deciding on a career, I wanted to do an arts degree. The wisdom of the time (late 60s) was that an arts degree would lead nowhere and I would get depressed if I did social work. A science degree was the obvious answer. Not. From the sheltered world of an all female private school (from the age of 4) to the world of lecture theatres and laboratories of hundreds of students from all backgrounds, I experienced extreme culture-shock. These days, I’d have done a gap year first and become more worldly-wise before those three years of confusion and emotional turmoil. But science did provide a pathway to Nutrition and Dietetics, which wasn’t widely known about or practised then. I was fortunate to enjoy a career as a dietitian for over 30 years. But I always swore I’d do the arts degree one day. When I retired, there was nothing stopping me. I completed the paperwork, waited along with the HSC students, and was offered a place at Sydney University, not long after my son had graduated. I planned to study English literature and philosophy, but soon found that in-depth analysis of novels spoiled my enjoyment of reading, and Philosophy tutorials were full of angry young men with huge egos. But when I sat in those old lecture theatres, where thousands – including a grandfather I never knew – had sat before, listening to and being challenged by new ideas, I felt that I had come home. I had been searching for this place for almost 60 years. My son advised me to try Studies in Religion. I’d had a couple of religious phases in my life, but this was not theology or comparative religion, but about religion in people’s lives. I learned a bit about major religions, New Religious Movements and resurrected and reinterpreted older practices. Can surfing be a religion? Or following a football team? And what is religion anyway? It was a mix of sociology, philosophy, art and more. A true classical education. The young students accepted and befriended me, the lecturers were erudite and taught well, and the subject matter was fascinating. 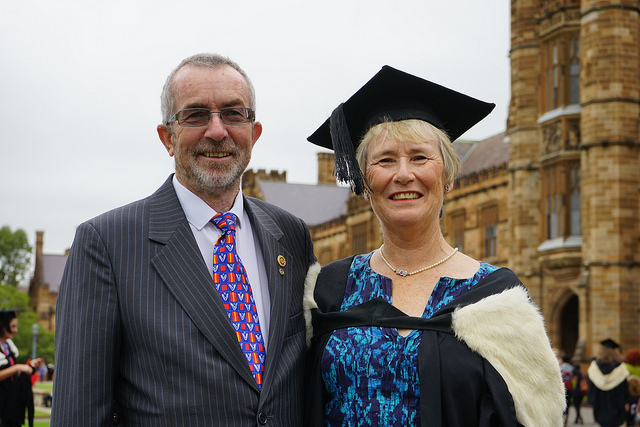 I had hoped to do honours, but my husband’s health, the cost, and the desire to spend some time travelling, all combined to lead me to finish after my undergraduate degree. But if the heady days of the 70s with free education were to return, I’d be back in flash. Because what I am passionate about is learning, and sharing knowledge. I remember in primary school, when other kids were fantasising about ponies and dolls, I longed for a sound-proof box so that I could get on with my classwork without distraction. I love writing essays, refining ideas and tweaking words and sentences until they read and sound right. I love the light globe moment when a new idea is revealed, or a difficult argument becomes clear. I love the research when one paper leads to another, and then another in an endless chain of ideas. And I love the cut and thrust of argument in tutorials. At the museum recently, when I was telling a visitor about some of the practices of out First Nations People’s, supporting the information with images from an iPad, he commented that I was an academic. I replied that I’d spent my career in the health system, not the Academy. “But you are an academic.” What a compliment! So I have identified my passion. I lack the self-discipline to study alone without the deadlines of tutorial presentations and essays, so my challenge now is I have to find the best way to put my passion into practice, not just to avoid the Big A but to enjoy life. I think really your passion might be for writing. Thanks Pippa, I have heard that there are writers who read and readers who write. I think Insm one of the second and suspect that you are one of the first. Loved reading this Sally. I’ve always had the greatest respect for your writing abilities. Great that you’ve discovered your passion.